And it's those ex Commie bastards in Russia and China but Japan is closing in . I've had to put in word confirmation (which I hate) for comments due to amazing amounts of spam. I hope you understand. "ex Commie bastards in Russia"
tintin: along with trucks spam was our main contribution to the Red Army victory in WW 2........maybe they're sending it back! Are you sure it's not the Iranians or North Koreans? 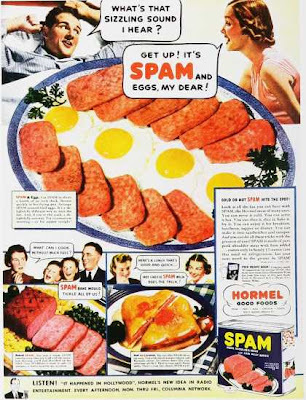 Spam and Eggs: two of the things that made this country great...for heart surgeons. Have you HAD Spam? Mind you, at least one person here likes souse, so there we are. It is pink, wobbly, overseasoned, canned and way down the food chain from a pig. So I may hate it, but it sounds like one or two past boyfriends. I've been able to stay away from Spam, however, I've had my share of Vienna Sausages and Deviled Ham. I believe these are all the same food anyway . . .
SPAM = The poor man's terrine. Deviled Ham = The poor man's rillettes. Vienna Sausages = Catfish bait. Which do you like better - SPAM or the "Ham Slice in Water" MRE? 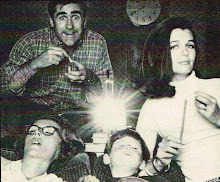 I loved the MRE, because at least it was solid food. Unfortunately, the entree was retired in the late 90s. Trying to do this from cell phone so pardon while I only answer Essex. Partial to pork slices in the old C. And the pound cake covered with chocolate icing made from the hot cocoa mix. B-1? Not sure. Had some LRPs (chili con carne was a hit) but MREs came after my ETS.